In the late 1980s, Topps released monochromatic mini figures in blind bags with along with packs of cheap, chalky candy. Nope, I'm not talking about Garbage Pail Kids Cheap Toys. I'm talking about the very obscure and seldom discussed Dino Toys with Candy Eggs! 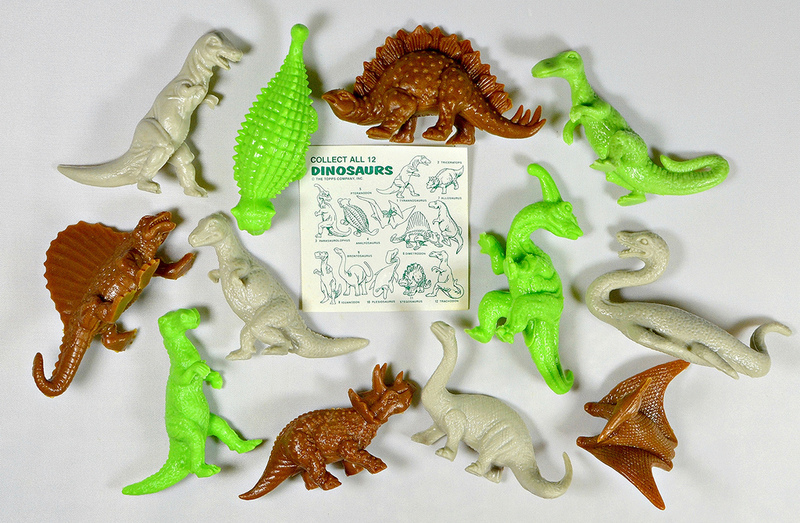 These prehistoric plastic goodies came out in 1988, to be exact -- the same year Topps released the classic Dinosaurs Attack! trading card set. I guess they were on a dino kick that year. 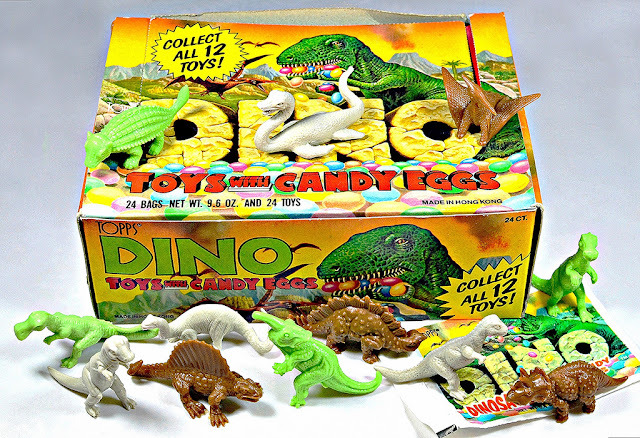 Even though the Dino Toys are not nearly as popular as Topps' GPK toys that used the same "blind bag with candy" concept, they are really awesome in that old school, cheap toy sort of way. In fact, they're some of my favorite dinosaur mono minis. Packs were sold individually and came 24 to a box, which you'd most likely find on the counter in candy, toy and hobby shops. 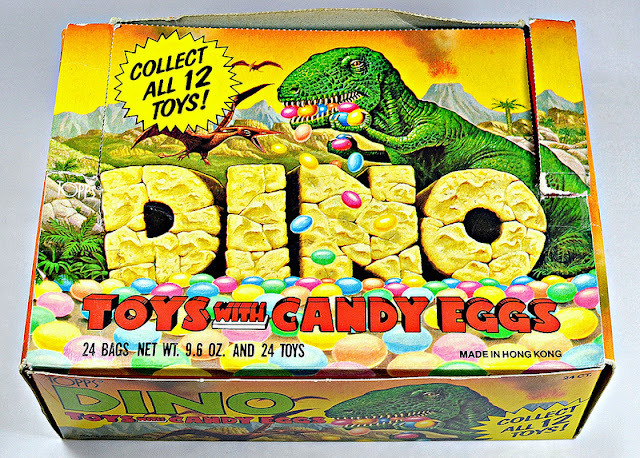 The box features colorful artwork of a T-Rex chompin' on some candy eggs while a pterosaur tries to get in on the action. 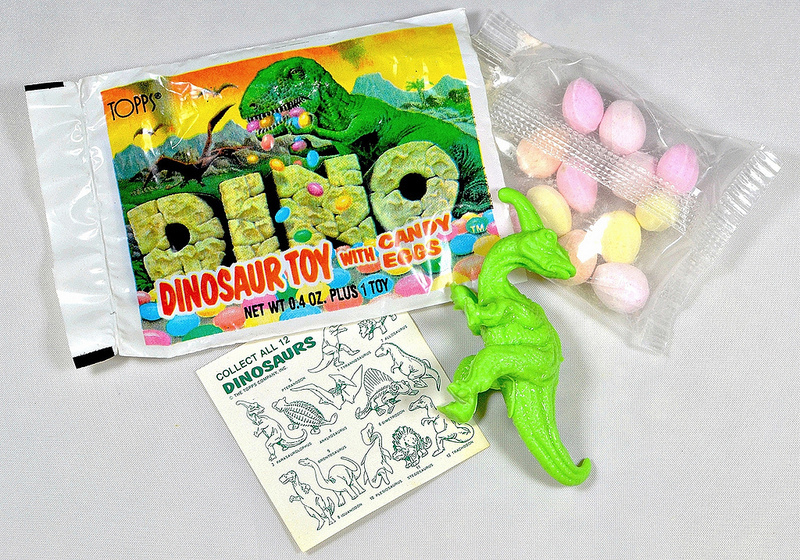 Each individual pack inside had the same artwork as the box and contained one random dino figure, a checklist showing all of the different dinosaurs available, and a pack of the eggs. From the looks of the candy, I'd imagine it tastes something like how Topps' Garbage Can-dy did, but I must admit I'm not brave enough to sample gobs of colored sugar that are coming up on 30 years old. Now for the most important part -- the toys! There are 12 different dinosaur sculpts that could be collected. The figures range from about 1 to 2 inches tall and are made of a hard plastic reminiscent of retro plastic dinosaurs from the 1960s. Each dinosaur came in three different colors: brown, gray and mint green. The green is by far my favorite, and the brown looks good too -- it's a nice chocolate brown that makes the details pop. The gray is a bit dull, but it does look nice when put together with the other two colors. It's hard to pick favorites, but the Plesiosaurus is probably my top choice. I also love the sculpts that have a lot of really cool bumpy texture like the Triceratops, Stegosaurus, Anklyosaurus, and Dimetrodon. Topps did a great job of capturing the fun vibe of retro dinosaur toys from the likes of Marx, Tim Mee and MPC while adding a bit more fierceness to the sculpts. I don't think these Topps Dinos have ever got their due among mini figure and dinosaur collectors (possibly because most don't know about them). 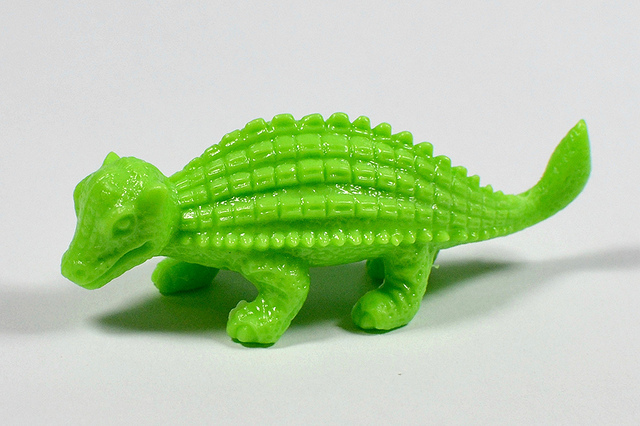 I got only one of them when I was a kid (the green Trachodon) and don't even remember getting it, but looking at them brings such a feeling of nostalgia for the days when this kind of thing was common and could be had for under a buck. What about you? 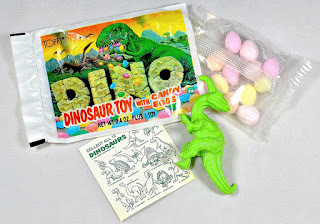 Do you remember Topps Dino Toys with Candy Eggs from back in the day? What do you think of them? Whoa, that pteranodon is REALLY similar to the Marx one. But I like the other adaptations, especially the way the Parasaurolophus is turning its head. Yeah, it seems for that one and maybe one or two others they pretty much copied the Marx designs! I've got a few of these, had them for as long as I can remember... Ankylosaurus, Pteranodon, Trachodon and Stegosaurus to be exact. The problem is now I'm confused! What do I have? Topps? Marx? Who knows? If yours match up exactly to the ones shown in this post, they should be Topps. While some of these seem to be very heavily inspired by the Marx designs, I don't think any are identical to them. You're hurting me, man. These are gorgeous. Definitely worth tracking down if you can! These look fantastic; amazingly, never seen them before. I MUST have a green version of that dimetrodon! Yeah, they are great! I am really surprised they are not more well known among collectors. I remember these! Yeah not the most original way to start a comment but I had completely forgotten these things existed until I read this, I'm pretty good with stuff I had a kid nowadays but I'd forgotten these completely, I owned the Anklyo, the Stego, Parasaurolophus and Triceratops and remember buying them from our local corner shop, but I was only two in 1988...eh, must have been old stock they got cheap (our Corner Shop was awlays doing that, they had Kombattini for instance, Kombattini weren't available in the UK officially). Yeah, it's funny how these were almost the exact same concept as GPK Cheap Toys, released around the same time by the same company, yet nobody remembers them and everyone remembers GPK Cheap Toys. Some of the coolest dinosaur minis IMO. These little guys are the closest things we will get to Dinosaurs Attacks! Toys. I got two as a kid at the now-defunct local chain general store Buyer's Fair. Green dimetrodon and a stegosaurus... I think the steg was brown. I didn't like how they ignored scale but I still appreciated the detail and relatively dynamic posing. This is still one of the best looking dimetrodons around. Then, as was the way in the 80's, the store stopped selling them before I could put a bigger dent in the collection of 12. Luckily I found a complete set with 1 checklist on eBay for about $20.